It is with much appreciation we announce the donation by the Chinese Benevolent Association. Two years ago the Chinese Benevolent Association presented a check for $20,000 to Tak Argentinis and Mark Dana for the Two Hundred Club and the families we honorably serve. Once again they sent a check for an additional $10,000. 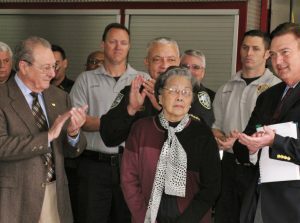 The Chinese Benevolent Association is helping to guarantee the Two Hundred Club can fulfil its mission of ‘Caring for those who care for us, today, tomorrow, and always.” It is with tremendous gratitude to the women of the Chinese Benevolent Association and other generous community partners, we can say one spouse and one child will be graduated this May.. .